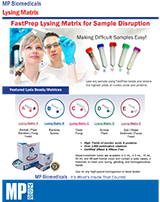 Mix and Match Savings on the entire MP Biomedicals Brand! 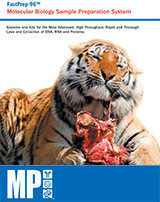 MP Biomedicals is a global corporation, with headquarters in Santa Ana, California, USA and regional offices in Europe, Asia Pacific and Australia. The corporation manufactures and sells more than 55,000 products. We are one of the few corporations in the industry to offer a comprehensive line of Life Sciences, Fine Chemicals and Diagnostics products. 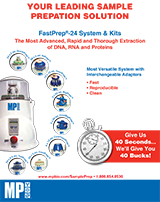 MP Biomedicals' product portfolio comprises one of the most exhaustive lists of time tested brands including Qbiogene, Bio101, Cappel, Genelabs and ICP Bio International. Our products are available in almost all major parts of the world and we continue to expand our portfolio with high quality and innovative products.